News: Microsoft Tech Summit Part 1: Are you ready for a transformation? Microsoft Tech Summit Part 1: Are you ready for a transformation? Microsoft’s Tech Summit, which took place in Cape Town this week, turned out to be a wellspring of insight and inspiration. It also proved to be surprising - while we expected it to offer much relevance to those in the development community, we quickly discovered that it held gems of value for those who aren’t technically minded as well. Certainly, the event was particularly pertinent to those who have a good background with Microsoft’s cloud offering, Azure, and its development tools. However, there was much to glean for any business that is embarking on its own digital transformation, which, increasingly is every business. For us, these insights started the day before the actual event, with special preview sessions. 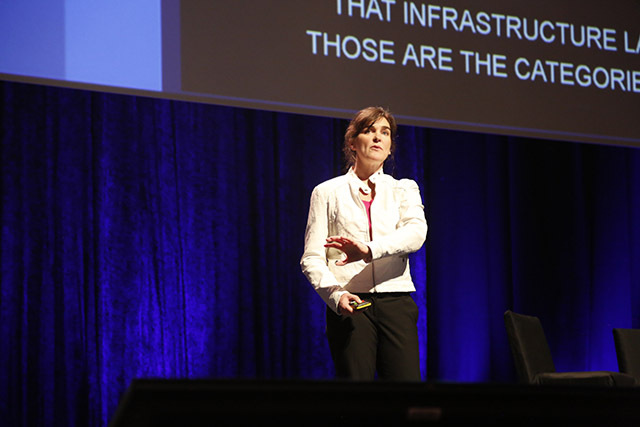 Victoria Grady, the GM for Azure marketing, noted that the pace of innovation that cloud is enabling, along with the “amazing” technology that is coming out, such as serverless and quantum computing, can also be overwhelming. This is exacerbated by the fact that anticipation for the possibilities around what the new technologies can offer is sky high. Added to this is the fact that IT professionals are expected to be experts at the new technology as it emerges, and all this can make keeping up with the fast and furious pace of change daunting. “My message is that this digital transformation is going to be a long journey. Microsoft is not just focusing on what, but also how we are delivering on the potential of these new technologies so that IT developers, professionals and entrepreneurs, can deliver these services in way that can make them successful,” she added. Speaking more about the “how”, Grady elaborated that the company takes a different point of view, governed by four main pillars. The first of these is productivity. “People are the most finite resource companies have, and thus our focus is on how we can make them as productive as possible,” she enthused. The second pillar is the hybrid cloud. Grady does not believe the hybrid cloud is temporal or transitory, rather she considers it to be enduring and here to stay for quite some time. The third pillar is intelligence – more particularly, artificial intelligence. “It’s really not a matter of if AI comes to the fore, it is happening, and thus Microsoft’s focus is on making it accessible to all developers, and not a function limited to those with a PhD in machine learning,” she added. The fourth and final pillar that would be unpacked in far greater detail during the Tech Summit was security. With the topic being at the forefront of every IT professional and business leader’s mind. Grady noted that the kinds of national threat level attacks that we are now witnessing are well beyond what most customers are able to contend with. However, she believes that rather than trying to keep up with these security threats in-house, customers could rather rely on Microsoft, which boasts 3 500 of the top security brains in the world. “This gives us a vantage point on the security landscape and a bright trust, enabling us to be first responders to severe threats. Our aim in that regard is to provide IT and developers confidence and peace of mind as they go about deploying cloud solutions,” she added. A word that arose a great deal during the two days was trust. This was a theme that wound its way through many of the discussions and keynotes, particularly on the subject of security. Grady pointed out that part and parcel of being trusted was ensuring that there is regional availability, and thus, Microsoft was bringing two datacenters to South Africa. These are not just buildings, but rather massive mini-cities of sorts, taking up four football fields worth of space and serving as major investments into a region. “Microsoft considers this a forward thinking region that is really forward thinking which is why the company is investing in bringing these data centres here. My big message is they are coming – are you ready?” she enthused. The benefits of having data centres in the South African region not only provides a competitive advantage, it also will have benefits to the IT industry with regards to reduced data latency, and disaster recovery. But what about the water? However, there was a glaring issue that Microsoft was quick to address. With Cape Town in the grips of its worst water crisis in recent memory, the question arose: should the company have held the Tech Summit in the city at all? Kethan Parbhoo, chief marketing and operations officer at Microsoft South Africa, noted that the question was put to the City of Cape Town ahead of the event, with the latter responding that investment is deeply needed in order to fund the necessary measures to mitigate the water crisis. Microsoft partnered with the non governmental organisation (NGO) Gift of the Givers Foundation donating $15 000 (just under R200 000) which would help the NGO in its initiatives to drill boreholes in impoverished parts of the city. “We also urge other corporates continue to make investment in the city, continue to hold events in Cape Town, and bring their investment,” he stressed. Parbhoo continued that one of the really exciting aspects of the Tech Summit, which is the company’s premier learning event for IT pros and developers, is that efforts had been made to ensure that attendees were give the same experience whether they were in Seattle, Cape Town or London. “This presents a great opportunity for South African customers to get same access to the world class resources that will get in other parts of the world, and hear about the latest trends, such as what’s happening around analytics, big data and Azure. “The fact that it is being hosted in South Africa for the second time is a testament to the fact that South Africa is an emerging market, is a catalyst for growth into the rest of the African continent,” he continued. If there was one challenge that the Tech Summit presented, it was how to consume all the information and insight offered over the two days. However, it certainly started off on an exciting note, raising plenty of questions and an abundance of possibilities.